I have always been fascinated by Middle Eastern cuisine. There is something so utterly sensual about the combination of flavours. Think plates of briny olives, tangy preserved lemons, bright red pomegranates, crunchy walnuts, plump eggplants and steaming lavash bread: I could go on and on… I was first introduced to this cuisine on a trip to Turkey many years ago and have been trying to recreate the recipes in my kitchen ever since. That’s why I just had to try this one when I first found it (I cannot remember where). It did not let me down! I have been making this dip for years now, to the delight of my dinner guests. I hope you like it as much as they do. The key to this dish is fresh red peppers. Don’t use roasted red peppers from a jar as I did once. The flavour will not be the same. Also, I have toned down the heat from the original recipe. I use Vietnamese chili garlic paste for a splash heat instead of the fresh red chili. Don’t be tempted to gobble it up right away. Let it sit in the fridge overnight to give the flavours time to mingle. You will taste a huge difference! Cut peppers in half lengthwise; remove stems and seeds. Place peppers cut side down on a baking sheet lined with parchment paper. Remove from the oven and place peppers in a glass bowl. Cover tightly with aluminum foil and allow to cool. Once the peppers are cool enough to handle, remove the charred skins. Discard the skins and place the peppers aside. To toast the walnuts, place in a small skillet over medium heat. Turn nuts gently until you begin to smell them and they turn a golden colour. Remove walnuts from skillet to a plate so they do not continue to toast. Chop walnuts, garlic and bread in a food processor until the mixture is finely ground. Add the peppers and process until well combined. Add the remaining ingredients and process until very smooth. Place in a covered dish and chill overnight. 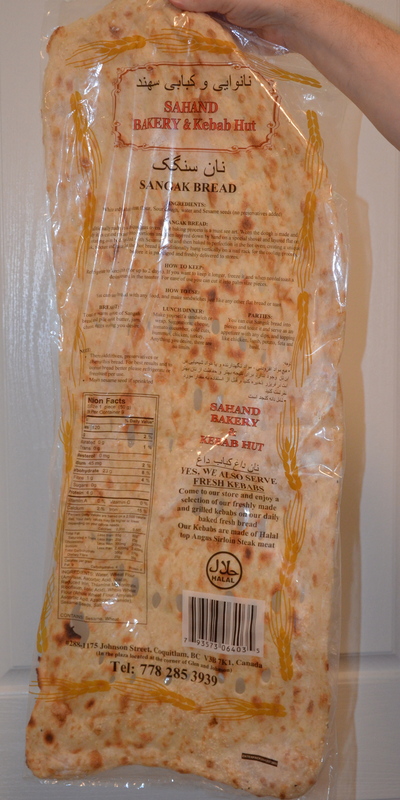 Serve at room temperature with Middle Eastern flatbread. (see note and picture below). This dip also makes a jaw-dropping sandwich spread! Slather it on a veggie or chicken sandwich and your family wont’ know what hit them!! This ingredient is really important for the flavor of the dish – sorry, you can’t substitute pomegranate juice. Most of my friends and family had never heard of it before, so here is a bit of information for other readers. 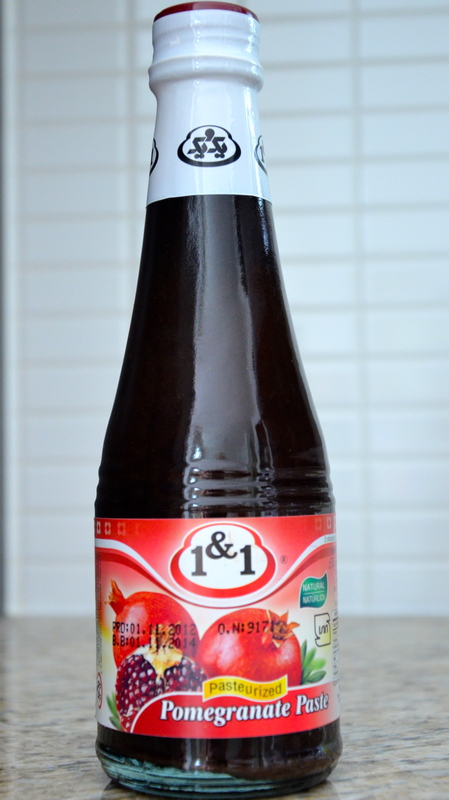 Pomegranate syrup is a thick reduction of pomegranate juice, sold in all Middle Eastern markets. It is used in so many different dishes. I asked the owner of the store where I shop, and she told me that some brands are really sour and others are sweet and sour. I mistakenly bought the really sour one once, so can tell you from experience that the sweet and sour one tastes better in this dish. Here is a photo to make your shopping easier. This is another item most of my friends and family were unfamiliar with. So here is a little blurb about it and a picture for reference. 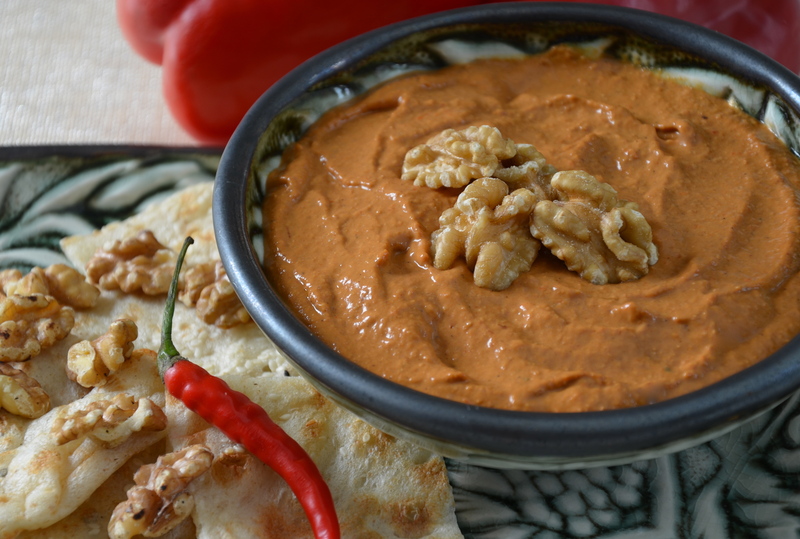 This bread has a lovely, unique texture that is perfect for the roasted red pepper dip. I cut it into squares with scissors before serving it. If you wish to give your guests a more, hands-on experience, just place it on a big plate and let them rip off the pieces by hand…all the more fun! Thanks for sharing this information on Sangak Bread. I have never heard of it or eaten it but you’ve raised my curiosity and I shall definitely look for it. I hope I shall find and taste it. Have a wonderful weekend! Hi Liz. I hope you can find it. I’m not sure where you live, but any store that sells Middle Eastern foods will have it. Also, I have noticed it at the big chain stores like “Save on Foods” and our local health food store. Good Luck! Yes! One and the same!